During the 1930s the German Army spent some time assessing the basic requirements for an infantry rifle, and they came to the conclusion that the traditional rifle cartridge like for the Karabiner 98K was unnecessarily large and powerful, since analysis revealed that the vast majority of infantry rifle fire was over short ranges. As a result work began by the Deutsche Waffen & Munitionsfabrik to develop a short 7mm caliber round; while this promised well, it was eventually stopped in favor of a 7.92mm design by Polte of Magdeburg, since this was of standard caliber and utilized a shortened version of the normal cartridge case, features which simplified production since much of the work could be done on existing machinery. With the design of cartridge settled, contracts were placed with Carl Walther and Haenel for the production of suitable rifles. The resulting weapons were known as the Maschinenkarabiner 42-MkB42(H) and MkB42(W). The Walther design used an annular gas piston surrounding the barrel to operate a tipping bolt, while the Haenel pattern used a more conventional gas cylinder and piston mounted below the barrel, also operating a tipping bolt. About 4,000 of the Walther and 8,000 of the Haenel model were produced in 1942-43 and issued to selected units on the Eastern Front for evaluation. As a result of their reports the Haenel pattern was selected for further development, particularly as far as simplification for mass-production was concerned, and the finalized design was issued as the Machine Pistol MP43. The StG-44 in Russia during 1944. Waffen-SS cavalrymen towards the end of the war. The camouflage clothing is clearly shown. The rifle is the MP44, a weapon of very advanced design and the first automatic assault rifle. King Tiger tank with paratroopers during the Battle of the Bulge. At least the soldier on the left is armed with the StG44. The MP44 assault rifle with ‘vampire’ infra-red sight, tested by a British officer after the war’s end. 3D model of MP 44. 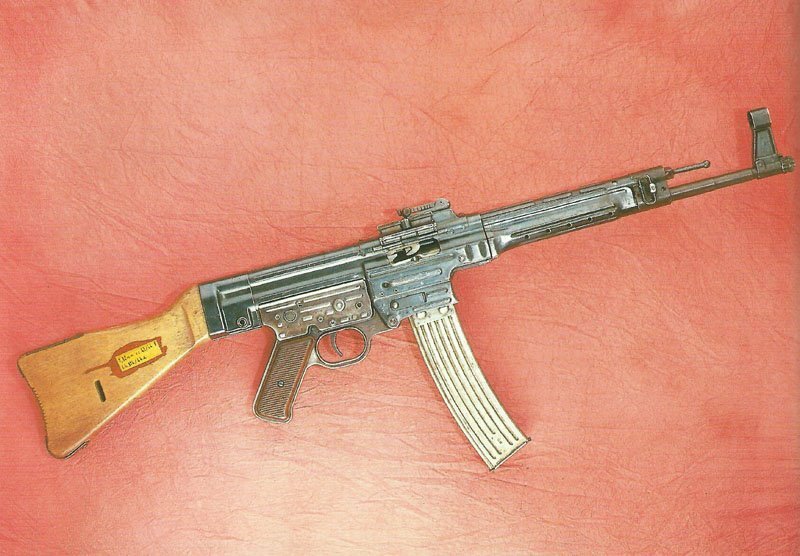 The Army Weapons Office therefore continued the development under the guise of ‘Machine Pistol 43’, development alleged before Hitler to be concerned with improvements to current machine pistol MP40 designs. Eventually experience with the first models of the MP43 (since April 1944 named MP44) on the Russian Front led to clamorous demands from the rest of the Army, and the Weapons Office, in a masterly political move, armed the personnel of the Waffen-SS Guard Detachment of Hitler’s Headquarters with the new weapon. This finally convinced Hitler of its utility, and following a demonstration in which its principal advantage – of firing full automatic during the assault phase of an attack – was demonstrated, it was officially christened the Sturmgewehr 44 or StG44, originating the term which has since become associated with this class of weapon. In spite of this, a contract was issued in 1944 to develop an even better weapon, tentatively known as the Sturmgewehr 45. Numerous designs were put forward, the most successful being that by Mauserwerke. But the war ended before development was very far advanced; the design was later taken to Spain and further developed into the CETME rifle, and then returned to Germany where, considerably improved, it is now produced as the Heckler & Koch Gewehr 3 and as well as being the standard rifle of the German Bundeswehr is widely used throughout the world. Dragon Anton Wessel Volksgrenadier w/StG44 "Vapyr"